The next time you are logging on to Vajor, we recommend a browse through their decor section. Hexagonal lamps, tassel wall hangings and cane jars are all bound to steal your heart. Want your home to be a reflection of your happy, free spirit, then, the decor offerings at Vajor are sure to pique your interest. The online shopping portal lists bath accessories, kitchen essentials, lighting, wall decor and a few other options under its ‘Decor’ tab. We checked each section out and have to say that Vajor is a great option when you want to pretty up the humble abode without burning a hole in your pocket. 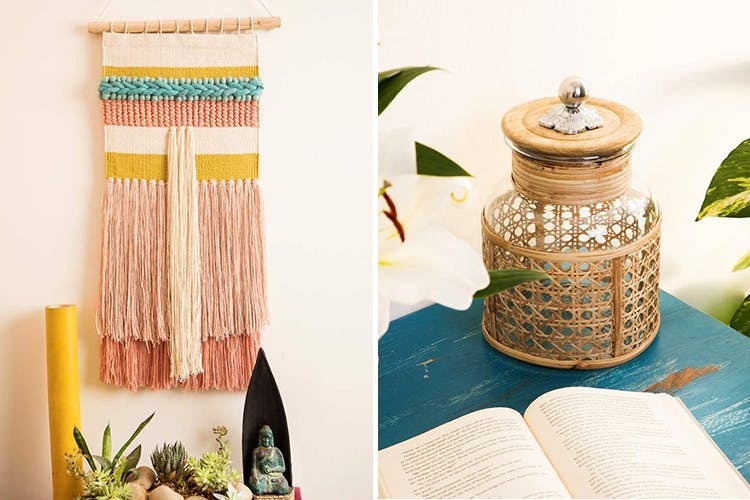 For the living room, the Pastel Tassel Wall Hanging, sporting mellow pinks and blues, is a must pick if you want to infuse a sense of serenity to your space. The wall hoops embellished with botanical motifs and colourful insects will usher in a touch of vintage. While the vibrant tapestries are sure to capture your guests’ attention. You can also perk up your living room with cushion covers that are decorated with pom poms, Aztec prints, and bold florals. You can light up the space with hexagonal, metal lamps and lamp shades crafted from jute. Let the ‘Boho Chic’ theme run through your kitchen as well. At Vajor, you can pick rustic, emerald green coasters that remind you of that exotic, seaside holiday you once took. They also have plates and trays adorned with florals and hipster jars and sip cups. You can also snap up jars with vintage, cane embellishments.